Designed to prepare you to work with and for urban schools, the master’s degree in Elementary Education is built around the core values of equity, access, and inclusion. These three tenets are integrated throughout coursework and practica so that you are ready to teach in culturally responsive ways. Our multifaceted partnerships with local schools and community-based organizations help you connect theory to practice as you gain experience in such initiatives as trauma-influenced practices and Science, Technology, Engineering, the Arts, and Mathematics (STEAM). Peabody College's Elementary Education program is ranked among the top five in the nation by U.S. News & World Report and aligns with the Interstate Teacher Assessment and Support Consortium (InTASC) and Tennessee state standards. Student thinking is the most important resource for a teacher. You will pay attention to students’ emerging ideas and understandings, building and bridging from their initial thinking toward deeper and more sophisticated understandings of subject matter. Through video assignments, practica, and student teaching, you will develop and refine your skills in eliciting, interpreting, and building student reasoning to advance student learning. The subject areas of school curriculum are characterized by distinct forms of discourse, norms, and practices. Subject-specific foundations and methods courses help you unpack these elements and develop the instructional vision and skills to foster children’s learning. Diversity is an asset, not a barrier. In paying careful attention to learners’ sense-making and knowledge of subject matter, effective teachers capitalize on students’ academic, cultural, and linguistic experiences and skills to promote both individual and group learning. You will learn to design instructional tasks with multiple points of entry, as well as identify and build from differences in student reasoning. Learning to teach occurs continuously—in relation—in and through practice. Learning to teach happens in interaction with students, colleagues, and others over time. It requires the opportunity to act and space to reflect, so that you can draw connections between practical experience, defensible theory, and sound research. As you grow increasingly skilled, you will take on increasing responsibility in your classrooms – becoming competent and trusted members of your school community. Successful completion of the master’s degree in Elementary Education leads to a recommendation to the state for a teaching license in K–5. The Office of Teacher Licensure coordinates teacher licensure policies and procedures for the Elementary Education program so you will be prepared to meet Tennessee and other accreditation standards for teacher licensing. Peabody College graduates who become licensed in Tennessee also can become licensed in other states. But completing licensure requirements may call for work beyond the normal degree requirements, especially if your undergraduate program was deficient in liberal education categories or in the academic major you have chosen for the Elementary Education program. Program Director: Anita Wager, Ph.D. Elementary Education graduates hold teaching positions in the United States and around the world. They find teaching jobs in public, private, and charter schools — typically the positions they want, in the places they prefer. Through Peabody, I learned to provide education of both the mind and heart. 100% of Elementary Education graduates were employed or attending graduate school within four months of graduation. You will be working with children throughout the program, starting in your first few weeks. Summer practica provide you a unique opportunity to engage with students in community-based summer programs so you will understand how to support learning in informal and academic settings. In the fall, you will spend two days a week at an elementary school in the Metro Nashville Public Schools (MNPS) district. In conjunction with a mentor teacher, you will observe and participate in all aspects of the classroom. You will observe several grades and interact with school staff, including administrators, family resource providers, and support staff. This authentic experience grounds the theories and strategies explored in your coursework. You will be paired with a mentor teacher for your internship teaching and spend five days a week in one of our partner elementary schools from early January through May. During this time, you will gradually take on more teaching responsibilities and have a 2-week period during which you plan, teach, and assess on your own. You will also have the opportunity to observe and support teachers in other classrooms and participate in after-school events. In the fall, you will focus on subject-matter foundations and methods in English language arts and mathematics. Your coursework will be grounded by a practicum experience in schools serving significant numbers of English Language Learners and students from economically disadvantaged communities. From January through May, you will complete student teaching, and in May through June, you will take courses linked by a focus on serving learners with specific learning needs in the areas of reading and science. Capstone projects are submitted and presented in June. 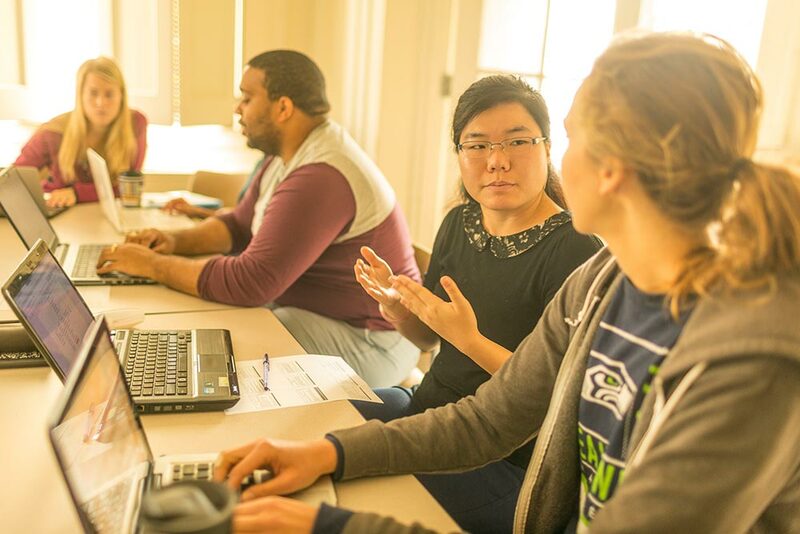 Department faculty come to Peabody College with years of classroom experience and a commitment to research that positively influences students' learning. Among other topics, current faculty focus on children’s literature, improving the quality of mathematics teaching, and supporting emergent bilinguals in literacy development.